Eelgrass is a type of marine, flowering seagrass that grows underwater in temperate marine environments around the world, and on the West coast includes three species: (1) Zostera marina, (2) non-native dwarf eelgrass, Zostera japonica, and (3) a distinct species to Southern California, Zostera pacifica. In 2014, TNC and PMEP produced the report, “Nursey Functions of U.S. West Coast Estuaries: The State of Knowledge for Juveniles of Focal Invertebrate and Fish Species,” which found that eelgrass (Zostera sp.) meadows are one of the most important juvenile habitats for a broad array of fish species. Understanding the spatial extent of eelgrass habitats in West Coast estuaries is important for restoration and conservation of this valued habitat. 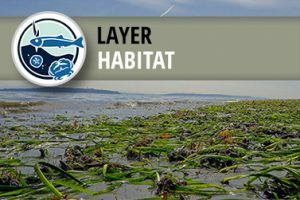 This downloadable geodatabase includes two feature layers (point and polygon) that document the presence, recently observed and maximum observed extent of eelgrass for estuaries and nearshore areas of the West Coast of the contiguous United States. This information is based on survey data that is documented in a related ‘dataset list’ table within the geodatabase. Eelgrass extent data are available in 120 estuarine systems along the West Coast, and throughout nearshore areas of the Salish Sea, the Channel Islands, and mainland Southern California. In total, nearly 130 eelgrass survey datasets were used to create this compiled, standardized dataset. See the report “Eelgrass Habitats on the U.S. West Coast: State of the Knowledge of Eelgrass Ecosystem Services and Eelgrass Extent” for a list of data sources, by estuary and year, included in this dataset. Please note: This is not a complete collection of eelgrass data on the West Coast, it is the best available information available at the time of compilation. The presence and location of eelgrass has been derived from multiple datasets and sources, from data collected over different time periods, using a variety of data collection methods. These data are intended for coastal and estuarine planning and not for navigation or site-specific impact assessment purposes. This package includes the eelgrass estuary points and maximum observed extent polygon layers, a dataset list table and all metadata.